Lazy Journalism: "A Google search for..."
This blog is about "design" and "usability," but I often interpret those terms fairly loosely. This post stretches their definitions into the realm of journalism, and may be better classified as rant than critique - but here we go! 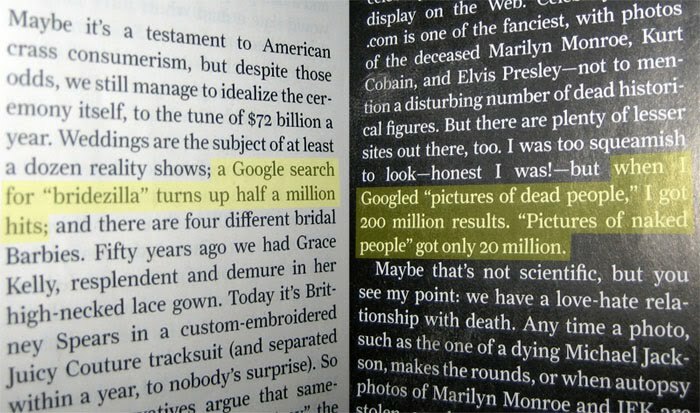 I was reading the June 21st issue of Newsweek, and twice in the space of a few pages encountered this journalistic abomination: "A Google search for _____ yields X million results." Jessica Bennett and Jesse Ellison committed the first offense ("bridezilla," half a million hits), and Raina Kelley is guilty of the second ("pictures of dead people," 200 million hits). Folks, this is NOT journalism: this is the laziest possible way to say "this thing exists." The Internet is unfathomably huge, and Google has indexed most of it; a search for practically anything will yield a high "hit" number that can be used - inaccurately and irresponsibly - to bolster your case. It's misleading, it's unscientific, it's useless, it's a poorly-designed writer's crutch - and worst of all, it works too well. In an age of "truthiness" standing in for truth, this trick should be purged from responsible publications. Now go do some real research. Thank you. Yes!! Thanks for pointing that out - I had considered adding that to the original rant, but took it out for efficiency. But you're totally right, it's a completely different search with or without the quotes. 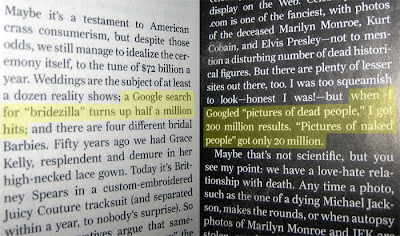 And what about roughly-equivalent searches, like "PHOTOS of dead people," or "pictures of dead CELEBRITIES?" Ugh. Thanks for the comment!